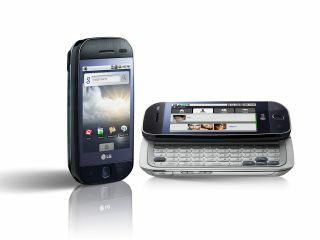 LG has officially announced its first Android phone - the GW620, designed for messaging and all manner of social networking. The new phone brings a 3-inch touchscreen, a full slide out QWERTY keyboard, a 3.5mm headphone jack, a 5MP autofocus camera and both Wi-Fi and GPS. We brought you news of the phone last week when it was spotted at IFA as the Etna, meaning it will probably be launched under different monikers in other regions. It's been slotted in for a fourth quarter release date to us European lot, with no word on other regions at the moment, nor any pricing or carriers helpfully. "The LG-GW620 will appeal to first-time smartphone customers by offering a new and different kind of user experience," said Dr. Skott Ahn of LG Mobile. "Our objective is to provide a wide selection of smartphones to satisfy the diverse preferences of today's consumers. This Android phone is just one of many smartphone models we plan to introduce worldwide in the years ahead." LG also announced plans to release mobiles based on Windows Mobile earlier this month, as the company looks to sprint up the sales rankings and start challenging Samsung and Nokia. Although given Windows Mobile hasn't won any awards for usability in recent years, the Koreans will hope the new iterations of the OS are a lot more popular.